So how has the "tea parties are racist" lie become so solidly branded into the minds of many? Then, it hit me. "It's the media, stupid." Last year I appeared on CNN fielding accusations that the tea parties are racist gatherings. During my interview, CNN showed the same sign of Obama as a witch doctor several times. 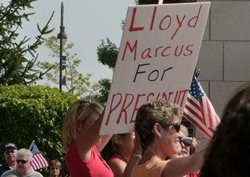 Meanwhile, 99.9% of the signs on display at the rallies expressed opposition to Obama's policies only. This is why I know the black democrat senators who said they were called the "n" word while walking through a crowd of tea partiers were lying. Not to mention the fact that if the incident really happened the video would be viral on YouTube. Folks, ask yourself. Would white people who one year ago voted in record numbers for a black man to lead our country suddenly have a desire to "take America back to 1963"? Ridiculous. Jealous' comments are hate inspiring, manipulative and evil. 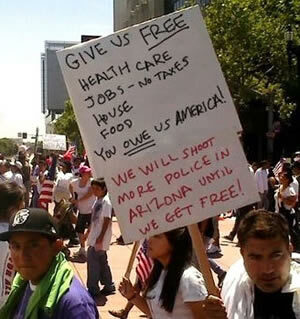 The tea party attendees are moms, dads, kids, grandparents and yes, mostly white, but they are not racist. Many even voted for Obama.